Throwback Thursday goes to Gem-Knight Seraphinite. So two cards in the main deck and one in the extra give you a free extra Normal Summon/Set. Pretty much every deck can utilize the effect and many decks want Brilliant Fusion in their opening hand to gain easy momentum. Seraphinite is the means to the end. Some people run 2 Gem-Knights in the main just in case the first Brilliant Fusion gets negated. In and of itself Seraphinite has a great name, decent artwork, and decent stats of Level 5 Earth Fairy-type Fusion Monster with 2300 Atk and 1400 Def. The effect powers up some rogue decks but it’s just too easy to Special Summon Spam these days and the Extra Normal Summon isn’t as relevant. Dumping cards into the grave is still huge so as long as Seraphinite and Brilliant Fusion exist, so does a good score exist. Throwback Thursday brings us to the best Gem-Knight Fusion arguably, despite Gem-Knights themselves not really using it that often, Gem-Knight Seraphinite. Seraphinite is a Level 5 EARTH Fairy Fusion with 2300 ATK and 1400 DEF and requires 1 Gem-Knight and 1 LIGHT Monster as materials. Those materials seem very random, but this means you can use Brilliant Fusion to send your Gem-Knight of choice as well as some LIGHT monsters like Fairy Tail – Snow, the Performages, Wulf, etc. 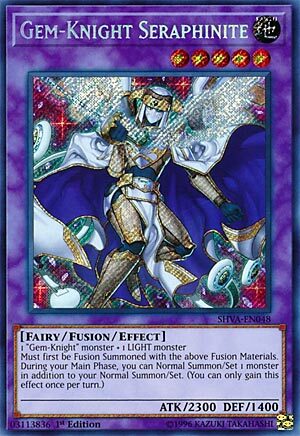 The 2300 ATK is good and the 1400 DEF is mediocre, but if you summon this off Brilliant Fusion, this will have 0/0 stats unless you want to discard a Spell. EARTH and Fairy are solid as Attribute and Type. Must first be Fusion Summoned with the above materials, so no Instant Fusion, otherwise this would be so much better. During your Main Phase, you can gain an additional Normal Summon or Set for the turn (You can only gain this effect once per turn). Hey, another Normal Summon is great and Brilliant Fusion is already helping you generate advantage by putting something in the GY you are probably going to revive and get back while deck thinning, so I’d easily say this is better than just playing Double Summon. Two Normal Summons for the turn while gaining some advantage, deck thinning, and putting another body on board to begin with is much better than naturally going minus 1 to activate Double Summon, though now-a-days Knightmare Goblin might be better than this in many decks. Seraphinite is the key component of the Brilliant Fusion engine and I’ve seen many advocate for that engine to get hit in many ways, and I believe it would be better for Gem-Knights if this took the hit instead of Brilliant Fusion. Not saying Seraphinite needs the hit, cause it is a good combo extender for many rouge decks, just saying that is the better option if the Brilliant Fusion engine becomes a problem. Art: 3.75/5 Eh, I’ve seen better Gem-Knight Fusion artworks. I’m a fan of Gem-Knights, and although we haven’t looked at Gem-Knight Seraphinite before, she is an old enough card to warrant a spot for Throwback Thursday. As you know, whether you play Gem-Knights or not, they love their Fusions, much like Heroes (I guess why these are supposedly Jaden character cards too?) Anyway, Seraphinite isn’t the strongest of the Fusion family. She has 2300 attack (and 1400 defense) which isn’t terrible for a Level 5 Fusion. A fairly vague Fusion requirement, of a Gem-Knight and a Light Monster (though you must Fusion Summon using the above stated Monsters, vague as it is). The effect is simple, yet welcome. It’s an Ultimate Offering effect, slightly tweaked, where you get an Extra Normal Summon/Set during your Main Phase. Said Extra Summon/Set is cool that it’s not Special (cause it gets around any/all no Special Summoning clauses) but it doesn’t have a Lifepoint cost or discard requirement, but I think the gem of the ability (pun intended) is how fast Gem-Knights can be, and adding another nice bit of speed. They aren’t the fastest, but this does help them along.